Professional Pet Sitting in YOUR home since 2005. Presently serving Chandler, Tempe, Mesa for petsitting in your home. 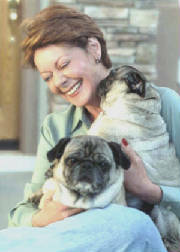 For those pets that need extra care - I am now offering petsitting in my home for senior and special needs pets. Hello, my name is Karen Scherer and I started Loving Hands Pet Care in 2005 for 2 reasons. First, my love of animals - young, old, big,small, 4 legged, 3 legged, hairy, hairless, slimy - WELL YOU GET THE PICTURE!! Second, because I lost my "Little Man" Mingus, an 11 year old Chinese Pug. He was diabetic for the last 9 years but lost his life to a tragic drowning accident and not his disease. + Pets are happier and healthier in their own home environment. +Eliminates trauma for your pet of being left in an unfamiliar place. +Eliminates hassles of transporting your pet to and from a kennel. +There is no exposure to other animals, sickness or parasites. +Relatives, friends or neighbors will not be inconvenienced by your pet and the additional responsibilities. +Gives you peace of mind, knowing that your pet will be cared for and your house will be looked after while you're away by a professional. Take a tour through my website to learn a little more about me and how I can help.